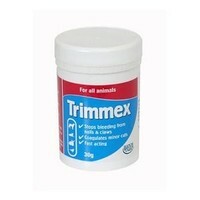 Hatchwell Trimmex Powder is a great product for attending to minor wounds and cuts. This medicated powder works to quickly stem bleeding which may occur during grooming, for example, bleeding when trimming your dog's nails. If the nail is cut too short, the blood vessel that runs through the middle may be caught and could result in bleeding. Suitable for all animals; it is a must-have, first aid product for any grooming enthusiast. Simply apply with cotton wool. Great stuff - styptic and antibacterial. Perfect for minor wound care at home. I dab a cotton bud or a rolled (gloved hands) piece of cotton wool to apply this and it works brilliantly. It does have a yellow colour which I presume is Iodine. This does not bother me, but may not be ideal if you are fussy about your hound's looks.